Thanks to its stunning natural beauty, abundant wildlife and numerous friendly towns and cities, Canada has long held a spot on the list of the world’s top travel destinations. Currently ranked in the number seven position, international visitors are drawn here to see sights like Niagara Falls and Whistler ski resort, as well as to visit the dramatic shorelines of its spectacular east and west coasts. Canada has also earned a name for itself as a leader in the fast-growing luxury lifestyles market, too – thanks in no small part to its being one of the planet’s safest and most sought after places in which to live, work… and, of course, play. When it comes to leisure and relaxation, few regions of this vast country can match the magic of Muskoka, also affectionately known as Ontario’s Cottage Country. Famous as the summer go-to destination for the wealthy, including celebrities and elites from the tech world and industry, this sprawling area of pristine lakes, rugged granite outcrops and oh-so-many trees – all of it less than two hours north of Toronto, Canada’s biggest city – has been a big draw for visitors in search of the great outdoors for well over a century. 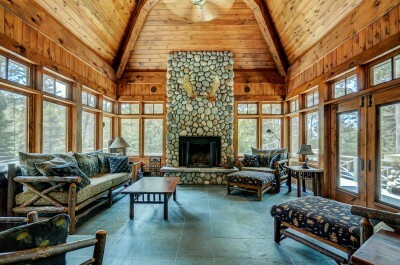 Nicknamed the ‘Hamptons of the North’ by the New York Times for its popularity as a summer playground for the rich and famous – the likes of Shania Twain, Tom Hanks, Goldie Hawn and Hugh Grant are regulars – Muskoka has also become something of a magnet for those seeking something a little different to the traditional luxury cottage experience. Setting the bar highest is Bigwin Island on Lake of Bays. 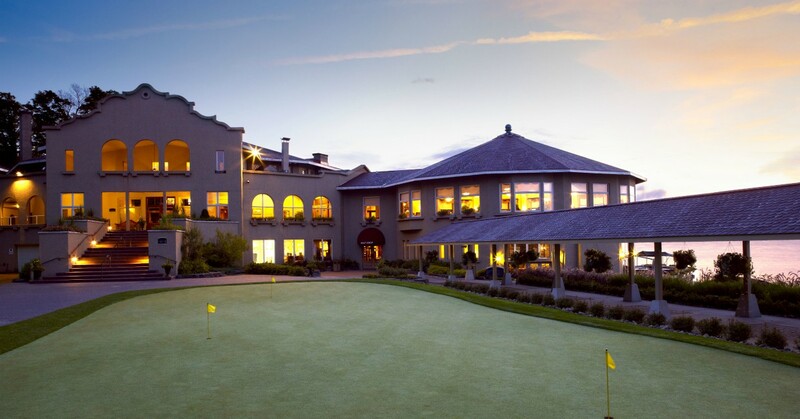 Much more than just a golf club – though it is ranked one of Canada’s top courses – Bigwin has evolved from a once bustling summer resort (the largest in North America at one time) to its present status as one of the continent’s most prestigious summer addresses. Covering an impressive 520 acres of prime cottage country real estate, this island paradise encompasses over 26,000ft of shoreline in what has become one of the world’s top vacation destinations. Named after Chief Joseph Big Wind, a much–celebrated Ojibway warrior, the island had been attracting local hunters and European traders since the early 19th century. As appealing a backdrop as it was for hunters, however, the island’s natural beauty – a picture-perfect mix of cliffs overlooking elegant bays and sheltered sandy beaches – ensured it caught the attention of entrepreneurs who recognized the region’s luxury travel potential. And so it was that Huntsville businessman CO Shaw built the magnificent Bigwin Inn, opened to great fanfare in 1920 and an instant hit with travellers in search of an authentic Muskoka experience, albeit one with a dash of elegance. Heralded as the finest resort on the continent, the well–heeled from across Canada and the northern US states flocked to the island, making the epic journey by train before boarding one of the many steamships that plied the lakes at that time. What they saw when they got there was indeed lavish, from the elegant design of its accommodations to the huge Grand Hall, a venue that would soon attract such music greats Count Basie, Guy Lombardo and Duke Ellington, and the impressive Rotunda with its massive stone fireplaces and huge wrap around decks. The island’s first nine holes of golf followed soon after. Then, as now, golf was to prove a big draw. Literally carved out of the wilderness by legendary course designer Stanley Thompson, the original Bigwin Island Golf Course welcomed its first players in 1922, with an additional nine holes being added in 1930. 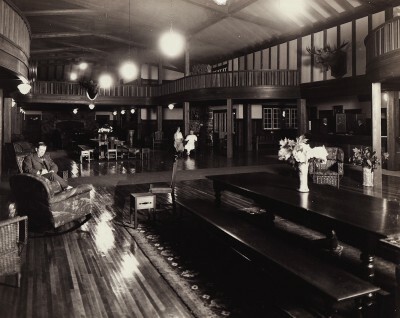 Along with the big name acts, the great golf, plus numerous outdoor adventures and endless watersports, Bigwin Inn soon became the preferred summer resort for socialites and the well to do. But with the world plunging into war in 1939 and the gradual demise of the steamship era that had originally opened the area up to tourism, Bigwin, like so many other fabled Muskoka resorts, was faced with the prospect of becoming yet another footnote to history. Fast forward half a century, however, and Bigwin Island has once again become the ultimate Muskoka getaway. Thanks to a forward-thinking development team, it has been re-imagined as an intimate island community of discerning families – and friends – seeking to own a share of paradise. Led by Jack Wadsworth, a successful American businessman with deep family ties to Lake of Bays (not to mention a passion for golf), the new vision for Bigwin began to take shape in 2008, not long after the long-time cottager took over as the property’s developer. While the crowds are no longer a feature, the same bespoke services and quality are everywhere evident. Revitalized and reinvented under the umbrella of Bigwin Island Properties, Bigwin today encompasses everything from membership in a private golf club (along with all the benefits), superb dining and beverage services, real estate and vacation villa rental opportunities, and perhaps most important of all, plenty of fun activities and programs for kids and families to enjoy together. While much has changed on Bigwin’s award-winning course, many of the same qualities and features embraced by designer Stanley Thompson back in 1922 prevail to this day, in particular its respect for the natural landscape. 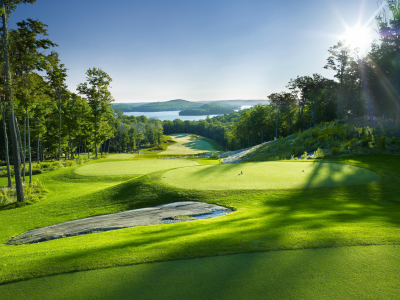 Redesigned and revived in the 1980s by Doug Carrick, whose Muskoka Bay course in Gravenhurst also delights, Bigwin Island Golf Club’s new par 72 course now boasts a yardage of 7,166 and a pleasant mix of both gentle and demanding play. Carrick himself has revisited the course, working with the club in 2017 on a program to improve playability that included a number of greenside bunkers being raised in order to provide better views over the greens. Course highlights include perfectly groomed fairways that act as corridors between the island’s thick forest coverage, an effect that’s especially attractive on the two signature holes: ‘The Lookout’ (the 6th hole), a 462 yard par four which, thanks to the 100ft elevation of its tee, offers incredible views over the lake; and the inspiring ‘The Lake of Bays’ (18th hole), a par five and the course’s longest hole. Another treat for golfers, and one that’s commented on a great deal by members and guests alike, is the abundance of wildlife. Of these, the most prevalent are the deer, which can often be seen nibbling grass along the edges of the course, adding a real park-like setting that wouldn’t look out of place in the UK. For those considering a golf membership, a great way to try-before-you-buy is to take advantage of Bigwin’s off-season public (and corporate) golf offerings. Public play is available Monday through to Friday in May and June, and again in September and October, and can also provide a great opportunity to enjoy superlative dining with one of the club’s ‘Dine and Grill’ packages (yes, it’s members-only during the peak summer months of July and August). Another great way to sample the delights of golf on Bigwin Island is a ‘Stay and Play’ package. Highlights include a chance to enjoy the delightful Victorian-era Port Cunnington Lodge, a beautiful boutique family resort just a few minutes by boat, as well as meals and a chance to take a trip on the historic and fully restored SS Bigwin, part of the inn’s original fleet. Another important tradition that’s been preserved on Bigwin Island is its food. Served up in the original 1920s Marine Dining Room, you’ll enjoy the views as much as the food, especially at sunset. The focus is very much on fresh, locally and regionally sourced ingredients. Equal importance is placed on the beverage side of things, too, with knowledgeable staff quick to recommend the perfect pairing of menu items with a broad selection of fine wines, beers, spirits and cocktails. In addition to the historic dining room, meals can also be enjoyed al fresco in the cosy screened-in porch or on the large promenade veranda. On-site catering is also available at private functions and corporate events, too, from weddings (check out the massive stone fireplace remaining from the original resort, the perfect backdrop for wedding photos) to charity golf fundraisers. Whether you’re a golfer or not, Bigwin Island also provides some of the most exclusive real estate opportunities available anywhere in Canada. For those looking to build something custom for themselves and their families, Eagle Landing – the real estate development division of Bigwin Island Properties – offers a variety of premium lots available for purchase with waterfronts ranging in size from 200ft to over 1,000ft. In addition to being located on one of the most tranquil stretches of Muskoka shoreline, you’ll benefit from inclusion in the Bigwin Island Waterfront Association, an active community of likeminded individuals set up to look after the island’s common lands, ensuring services provided to owners are properly managed and maintained. The association looks after some 80 acres of the island, including interior connecting paths and service corridors, as well as densely treed areas that act as substantial buffers between the cottages and the fairways. All told, 112 properties have been severed for private ownership, with a number of choice premium lots still up for sale. Property purchases can include an equity golf membership, with the option, if needed, of professional project management services including referrals of select architects and builders, budget and scheduling assistance, along with construction logistics. Some resales also come available from time-to-time (check with Bigwin Island Properties directly for details). Other services and benefits provided include mainland parking, short-term docking facilities at Norway Point for dropping off and picking up guests and supplies, as well as use of the regular shuttle service to and from the island. Dock-to-cottage shuttle services can also be requested. The latest addition to the Bigwin Island cottage collection are its sumptuously designed and well-appointed Club Cabins. 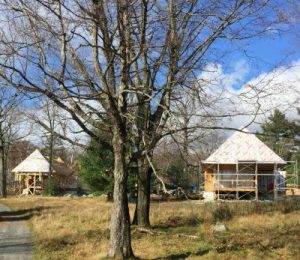 With construction starting in 2017, the first of these luxury units will be ready for occupancy in time for the 2018 season. Set up in a classic ‘village hub’ style just a short walk from the Clubhouse and other island amenities, owners of these architecturally pleasing cottages will have access to the same bespoke services available to golf club members. 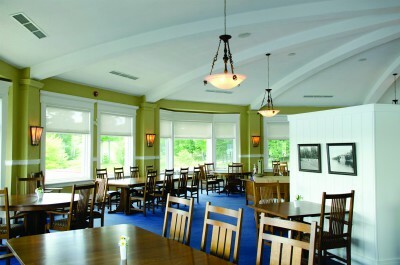 In addition to being nice to look at – great care has been taken to choose a design that fully complements the island’s rich history and the Muskoka aesthetic – the ‘flex design’ of these units incorporates the use of practical construction techniques and the latest technology. The architects have even gone as far as taking into account the grazing line under the trees created by the island’s many deer, a surprising yet important consideration in establishing great views over the fairways and lake. Bryan Dearsley is Editor-in-chief of Luxury Globe Media, a leading worldwide source of luxury lifestyle and luxury travel news.